The southern side of the Yarra River is an entertainment and dining complex including Southgate Promenade, Eureka Tower, Crown Entertainment Complex, Melbourne Exhibition Centre and Polly Woodside Maritime Museum. The area of Southgate is also Melbourne's artistic centre including the 'inspiring' Melbourne Concert hall and the National Gallery of Victoria. Southgate Promenade offers shops, pubs, restaurants, food mall, street performers and river cruises departing from Southgate Berth. Not only the world's tallest residential tower, but a viewing floor (Eureka Skydeck), viewing box (the edge), Resaurant (Eureka 89) and art installation (Queen Bee). Crown Entertainment Complex includes a casino, many restaurants, bars, clubs, bowling, games and theatres, definitely the centre of Melbourne nightlife and entertainment. Dubbed Jeff's Shed, Melbourne Convention & Exhibition Centre is the largest exhibition venue in Australia hosting many regular conventions, exhibitions and expos. A graceful, iron-hulled, three-masted barque, built in Belfast in 1885, Polly Woodside ended her days as a coal hulk in Port Melbourne. Restored by volunteers, the ship is the centrepiece of this maritime museum. An old cargo shed houses maritime relics, models of ships, film footage and photographs that show the early history of Melbourne's port. Over the river on your right is The Arts Centre and the National Gallery of Victoria. On your left is Alexandra Gardens and the Melbourne Boathouses (Boat Sheds - rowing). Then Queen Victoria Gardens and the floral clock. Then Kings Domain [Government House and Sidney Myer Music Bowl and finally the Shrine of Remembrance. Discover and enjoy the diversity of the National Gallery of Victoria's collections and exhibitions through the extensive range of programs, guided tours, cultural and social events and activities on offer. The Arts Centre is a complex including Hamer Hall (symphony concerts); State Theatre (opera performances); BlackBox (cabaret, modern music, stand-up comedy, experimental theatre); Fairfax Studio (drama); Playhouse (drama) and various other spaces. 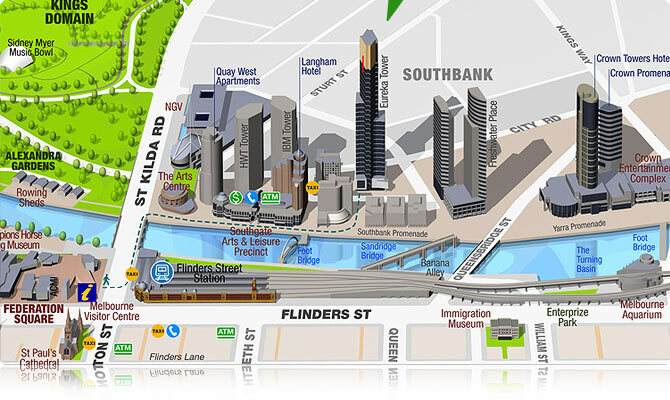 A short walk from the centre of Melbourne [Federation Square], takes you across Princes Bridge [south] and Southgate is immediately on your right. If you are on the left side of the bridge, take the steps down and keep left walking back underneath Princes Bridge alongside the river. If you are on the right side of Princes Bridge, take the first set of steps in front of the entertainment complex (spire) or walk a little further along and take the walkway on your right which curves back down towards the river.